I may have purchased more then half of these for The Squeeze for Christmas or right now 😉 haha. I just couldn’t help myself. 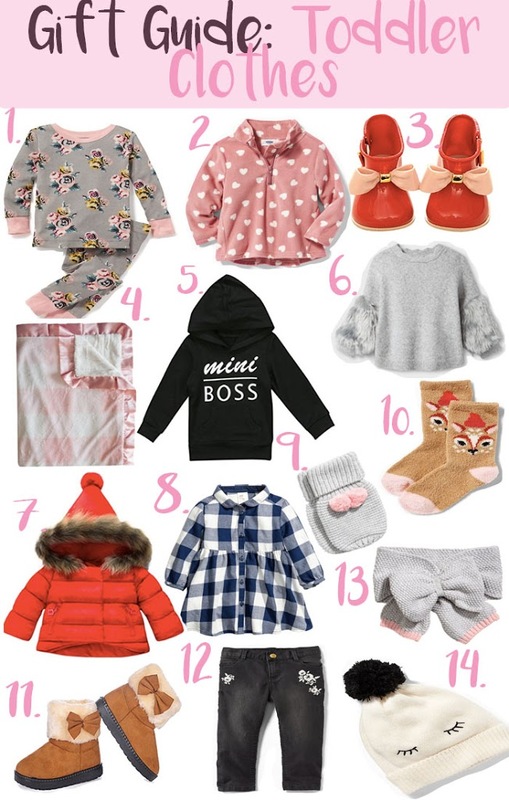 So, I know every toddler is different, but all I know is Lemmon so I based this gift guide off what I think a toddler like Lemmon would like. I hope your bebita will love them too!! #1 Pajamas: How stinkin’ cute are these floral pj’s? I love two piece pj’s for Lemmon because if she has a blow out I don’t have to wash the whole outfit. Just the bottoms and then I can switch in some leggings. Or if it’s to warm to wear both but to cold to wear a shirt and bottom then these are the best! #2 Heart Micro-Fleece Pull Over: You can never have to many jackets during the season. This is something great that she can just throw on if your running to the store or even layering underneath a puffer jacket. Plus with the little hearts, it’s so cute! #3 Mini Rain Boots: Confession, I have now ordered all 3 pairs for The Squeeze! They are to die for in person! And with the price point, I wish they had more colors! They are great condition too! Definitely stay in their same size or size down. It says to size up, but don’t listen to it. Lemmon wears a 5 or 6 and both are great on her. They button on the side and she loves to help put them on. If you’ve seen the mini-melissa boots, then these are seriously the most perfect dupe! Order these, you won’t be disappointed. Oh yah! They come from China, so be expected to wait about 3-4 weeks. #4 Minky Blanket: Lemmon’s favorite blankets are her Minky’s. We have quite a few of them but have to keep one or two in the car and then two in her crib and then two more are dragged around the house. They are so soft and keep her so warm! #5 Mini Boss Hoodie: I died when I saw this! I had to snag one for Lemmon. And with how cheap it is! I got her a size 1- 2 years. #6 Faux Fur Sleeve Pull-over: I love anything with fun sleeves for Lemmon. I’m not a fan of prints or wording so sleeves like these are perfect to spice up an outfit. Plus, anything with fur Lemmon calls her “Suave” haha, she will sit there and pet her shirt all day! #7 Hooded Snow Coat: I have yet to find a snow coat I love for The Squeeze. This one is so adorable with the fur lined hood and the little pom pom on the top. I wanted something that was thick for her but cute also. They also have it in black! #8 Checked Flannel Dress: I love checker print on kids. It’s adorable! This dress would be so cute with some tights and booties! #9 Knit Mittens: How adorable are these?! They are perfect for being out and about to keep those little fingers warm! And they go perfect with #13. #10 Cozy Socks: Lemmon has this fascination with socks lately. “Suaves” plus socks. She will be in heaven!!! #11 Fur Bow Uggs: I just about died when I saw these. I have a pair of uggs that look pretty similar to these and Lemmon is obsessed with them. I mean, how cute are mini uggs?! #12 Embroidered Skinnies: It took me a second to get on the embroidered train, but when I saw these I fell in love! I like how simple they are. Skinny jeans are so cute on babies! #13 Bow Scarf: I am all for layers! And how cute is this bow scarf. It’s not scratchy or irritating and will keep them nice and warm. #14 Lash Beanie: This has been in my cart for a bit. I keep going back on forth only because Lemmon’s fro is hard to hide under a beanie haha. Other then that I would jump right on it! I love lash anything!